The American composer Marc Blitzstein (1905�) was best known for his left-leaning stage works; indeed, his pro-union musical The Cradle Will Rock achieved some notoriety in 1937 when the authorities shut it down. But Blitzstein was also a fine pianist and wrote for the instrument all through his career. This first album ever devoted entirely to his piano output offers a conspectus of 45 years of Blitzstein抯 music, from lyrical juvenilia via spiky protest pieces and jazzy dance numbers to intimate 慺amily� pieces for close friends. The pianist is the Blitzstein expert Leonard Lehrman, whom Leonard Bernstein called 態litzstein抯 dybbuk�, and who for decades has been one of the leading Blitzstein scholars. Leonard Lehrman is the composer of twelve operas and 220 other works that have been heard on every continent save (to date!) Antarctica, and author of 64 translations from French, German, Russian, Hebrew, Yiddish and Ladino. 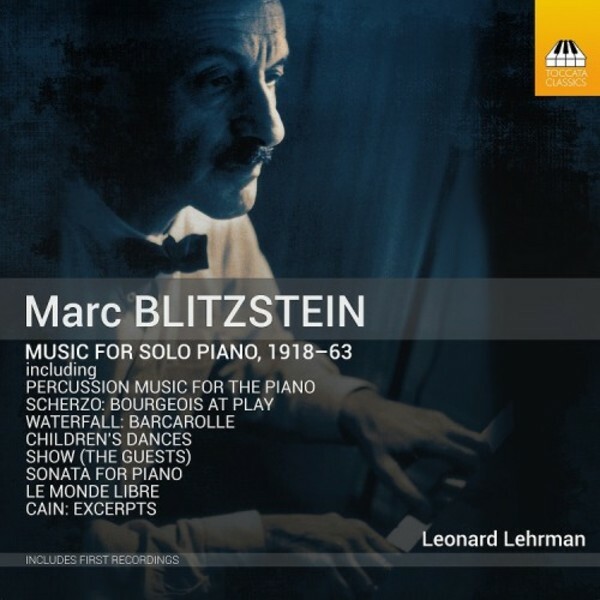 He has completed and/and or adapted a number of Blitzstein scores and catalogued all 128 of Blitzstein抯 works for the 645-page Marc Blitzstein: A Bio-Bibliography. In 1988 he founded and still directs The Metropolitan Philharmonic Chorus, which will premiere Blitzstein抯 1934 Children抯 Cantata in 2019. He has over a dozen recordings to his credit, on Albany, Capstone, Opus One, Original Cast, Premier and Ravello, and over 3,000 videos with c. 450,000 views on YouTube.